Omniclean will be running an open ended special for as long as stocks last. To receive your free carpet cleaning kit spend R1000 or more using our cleaning services and you will be gifted a Spotter Kit. 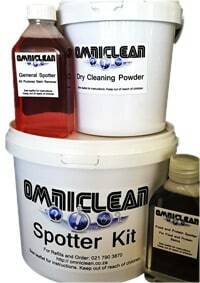 Our Spotter Kits are excellent for cleaning up small stains and marks on your carpets, where a full clean is not required. They can also be used on upholstery and curtaining and are non-toxic. Please contact us for your cleaning requirements and get a quotation. If the quote is over R1000 you will receive a free Spotter Kit on completion of the work. We look forward to cleaning your homes, carpets, upholstery, blinds.